Turns received economic wisdom on its head to show you how the world really works. In this book, the author destroys the biggest myths of our times and shows us an alternative view of the world, including: there's no such thing as a 'free' market Globalization isn't making the world richer; poor countries are more entrepreneurial than rich ones. 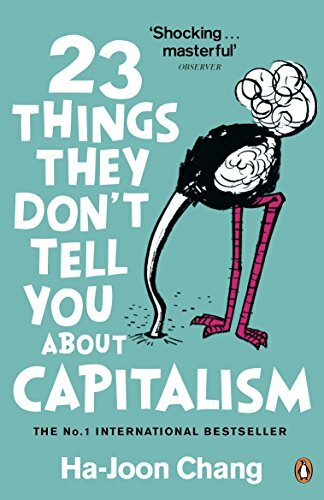 Ha-Joon Chang's 23 Things They Don't Tell You About Capitalism turns received economic wisdom on its head to show you how the world really works. In this revelatory book, Ha-Joon Chang destroys the biggest myths of our times and shows us an alternative view of the world, including: There's no such thing as a 'free' market Globalization isn't making the world richer We don't live in a digital world - the washing machine has changed lives more than the internet Poor countries are more entrepreneurial than rich ones Higher paid managers don't produce better results We don't have to accept things as they are any longer. Ha-Joon Chang is here to show us there's a better way. 'Lively, accessible and provocative ... read this book' Sunday Times 'A witty and timely debunking of some of the biggest myths surrounding the global economy' Observer 'The new kid on the economics block ... Chang's iconoclastic attitude has won him fans' Independent on Sunday 'Lucid ... audacious ... increasingly influential ... will provoke physical symptoms of revulsion if you are in any way involved in high finance' Guardian 'Important ... persuasive ... an engaging case for a more caring era of globalization' Financial Times 'A must-read ... incisive and entertaining' New Statesman Books of the Year Ha-Joon Chang is a Reader in the Political Economy of Development at the University of Cambridge. He is author of Kicking Away the Ladder: Development Strategy in Historical Perspective, which won the 2003 Gunnar Myrdal Prize, and Bad Samaritans: Rich Nations, Poor Policies and the Threat to the Developing World. Since the beginning of the 2008 economic crisis, he has been a regular contributor to the Guardian, and a vocal critic of the failures of our economic system.